marks the 72th Anniversary of the Los Altos Kiwanis Pet Parade! Join us at 10am for this pagentry of the pets. Walk with your pets or pull up a chair curbside on State & Main. 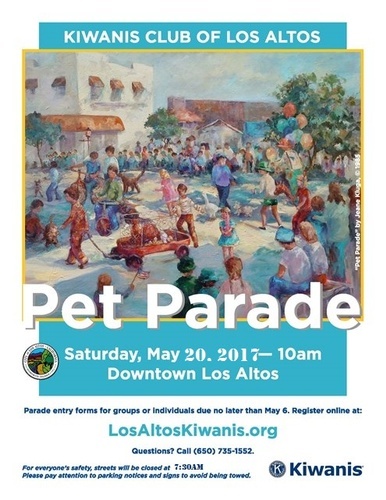 A beloved community tradition since 1948, the Los Altos Kiwanis Pet Parade is a celebration that attracts thousands of people every year. Traditionally, this free Los Altos Heritage Event is held annually on the Saturday following Mother’s Day. Hundreds of kids and their pets — dogs, cats, birds, chickens, turtles and even worms — participate. There are also youth groups, marching bands and dignitaries in vintage cars! Walk with your pets or pull up a chair curbside on State & Main.